Goa has been witness to some spectacular changes in the last decade. Gone are the days when it was just associated with simple, seaside retreats strung with extravagant hotels. This place has graduated to a breathtaking destination wedding venue with a range of the best (and jaw-dropping) beachfront wedding venues that are aimed for the tasteful travellers. Perfect for a bespoke wedding celebration, it caters to couples looking to unwind and celebrate amidst its magnetism. Getting hitched in Goa has never been more romantic. Here’s a list of the popular beach venues Goa that aim to make your special day extra special. Located on the secluded beaches of South Goa, this venue is a combination of beautifully-manicured lawns and a seaside forest that provides the perfect atmosphere for celebrating cherished moments. Whether you are looking for breathtaking sunset ceremonies or cocktail parties, this luxurious place promises to make your time worth the moolah. If you want something more intimate, the venue has an efficient management that leaves no stone unturned in transforming your dreams to reality! Ideal for destination weddings, this mesmerising marriage venue offers a gargantuan 9,000 sq. ft. space for the quintessential Goan wedding with all the trimmings. Offering multiple outdoor venues that have scenic views of the sea, it has a professional staff that micromanages every event. The Marriott is the ideal place for a romantic and scenic wedding with lovely Mandovi River views. If you are looking for an amazing sea view, delicious seafood and beautiful sunsets for your wedding celebrations, then Zeebop will not disappoint. A truly wonderful blend of an outdoor ambiance and good entertainment take care of your beach wedding cravings. You’ll love the sandy flooring and relaxed atmosphere as this venue encompasses the essence of all things tropical. Get married as the sun sets on a hilltop, which overlooks the magnificent Indian Ocean and picturesque small Vagator beach. This place is full of warmth and sheer happiness with unique Greek hospitality. What we love about this popular beach venue Goa is the laid back atmosphere and the serene vibe of Goa. The design and ambiance transports you back to Greece instantly. We can’t think of other better ways to tie the knot. If you are planning a destination wedding in Goa to enjoy its natural beauty, fine cuisine and world heritage architecture, Radisson Blu is the place for you. A 10-minute walk from Cavelossim Beach, it offers breathtaking views of the Arabian Sea and provides the perfect ambiance for your celebrations. This popular beach wedding venue in Goa is equipped to handle large gatherings and has spacious outdoor lawns or beachside space for your occasion. 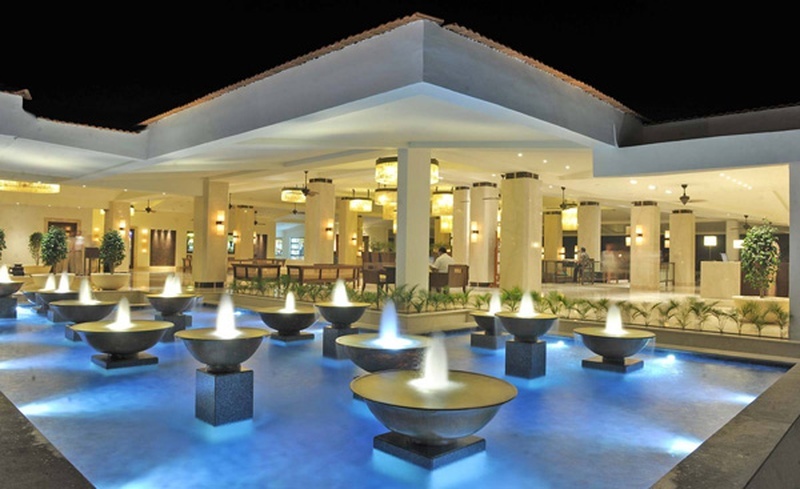 Located at the picturesque Mobor beach in South Goa, this venue has direct beach access. Offering a unique blend of traditional Goan and contemporary architecture, it is quite close to the Dabolim International Airport and just 17km from the Margao Railway Station. Organise your wedding day at the multiple party areas available here to satiate the beach lover in you. So, dive in as you get an unparalleled view of the majestic Arabian Ocean the moment you enter the lobby. Nestled at the Uttorda Beach, Island View endeavours to blend beach and sea with expansive green lawns. Ideal for hosting all kinds of wedding functions, it is flexible enough to allow you to get your own caterers and a decor team. It enjoys proximity to the Madgaon railway station, making travelling easy for the guests attending your wedding. If you've always wanted to have a beach wedding, then Island View is the perfect venue for you!